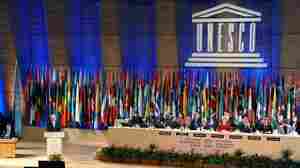 October 31, 2011  UNESCO votes to admit Palestine, ensuring a cutoff of U.S. aid to the U.N. organization. The U.S. and Israel have also warned that the action could harm the Middle East peace process. Foreign Minister of the Palestinian Authority, Riyad Al-Malki delivers a speech at the headquarters of UNESCO in Paris. October 31, 2011  Because of the vote, the United States said it would cut its funding for the body. The U.S. said admitting Palestine was "premature." October 30, 2011  In an interview, Assad said calls by the protest movement for a Libya-style no-fly zone over his country — or any other form of intervention — will cause chaos. Assad's regime has long made this argument to maintain its grip on power. But the U.S. and its allies have shown little appetite for intervening in another Arab nation. October 30, 2011  Syrian President Bashar Assad warned of an "earthquake" if any outside forces intervened in his country. Meanwhile, protesters say dozens of people were killed in the last few days, making this one of the bloodiest weekends since the uprising began. October 30, 2011  Rebuilding Libya will be complex, but the Libyans should be able to pay for reconstruction with their oil. Host Audie Cornish talks with John Hamilton, a Libya expert at Cross Border Information, about the current state and future of Libya's oil industry. 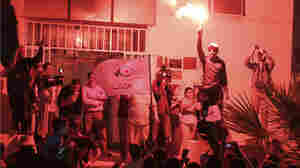 Supporters of the moderate Islamist party Ennahda celebrate Tuesday after the party received the most votes to form an assembly that will write a new constitution. Tunisia was the first Arab country to stage a revolution this year, and the first to hold elections. October 27, 2011  The Arab uprisings brought down dictators. But it's a long, tough road to build democratic states and strong economies that can sustain restless populations. The banking scandal has political implications in Iran, and the president's top adviser, Rahim Mashaei, has come under criticism. He's shown here in 2007. October 27, 2011  Several of Iran's largest banks have been swindled out of an estimated $2.6 billion. The scandal has sparked a widening investigation with more than 30 arrests so far. 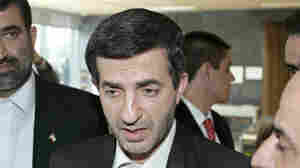 Some question if advisers close to President Mahmoud Ahmadinejad are involved. October 27, 2011  Another prisoner exchange is expected in the Middle East on Thursday. Israel is freeing 25 Egyptian prisoners — mostly smugglers and drug dealers — in exchange for an Israeli-American who was detained in Egypt four months ago on suspicion of spying for Israel. Israel has denied the accusation. October 26, 2011  Activists report at least nine civilians were killed in Syria Wednesday. State TV reported President Bashar al-Assad's supporters packed a square in Damascus. He is being pressed to start a dialogue with the opposition. Washington Post foreign correspondent Liz Sly talks about recent developments. October 26, 2011  The Turkish military launched its biggest military operation in a decade after a deadly raid last week by Kurdish militants. 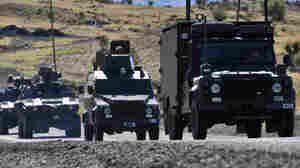 The operation comes as politicians begin to debate a new constitution that many hope will grant Turkey's Kurdish population long-sought civil rights.